We hope you can make it. It’s our way of saying thank you for making this farm possible, and celebrating the beautiful part of all our lives that it is. 2015 is our 10th year growing here — and it’s taken this community to raise this farm! Ten years is both long and short –mostly short in the cosmic scheme of things, but we’d like to share some glimpses of history you may or may not have heard before. There are so many moments and tidbits that are interesting and touching about how this has unfolded, it’s impossible to mention them all or all the people, but here’s a sampling. Erin and Ben met working at the Food Bank Farm in Western Massachusetts, near where Ben grew up. We both come from families that love plants and being outdoors, but have no recent farmers in our lineage. We came out of young adulthood with a passion for great food, helping people and the Earth live better lives, and after various jobs and travels came to working on vegetable farms. Our first farmer employers were obviously very patient and thorough teachers! We needed hours of training, coaching, eye-opening, and many more hours of good hard work in the fields, to get us to the point of being audacious enough to think we could run a farm business of our own. We were weeding herbs together at the Food Bank Farm in the summer of 2003 when we first started talking about a farm of our own. What a dream! We drew, we sketched, we talked, we wondered, we absorbed all farming knowledge we could. The decision to move to Erin’s home state of Minnesota was fairly easy, but the leaving of our beloved friends, family and landscape in the Northeast was very hard. Life is full of mysteries though, and this is clearly, for us, where we feel we belong. By the time we put our hands in this soil, Erin brought the experience of 8 years on other farms, Ben a total of about 4. We mimicked a lot of systems and practices that we saw working at other farms. For the molding of this new thing called Open Hands Farm, Erin brought the wisdom and patience. Ben brought the ideas and forward momentum. That push-pull of new directions and steady determination is still one of the main dynamics that we think makes this place thrive. We came to see family here in the winter of 2004-2005, and visited several farms or pieces of land that we thought might work for us. Nothing quite fit, until Erin’s Mom suggested we talk to Mary Ellen Frame. It was a match made in this heaven-on-earth, but if we say to many nice things about Mary Ellen she blushes. We met with her at Just Food Co-op, but didn’t have a chance to see the land. Soon Erin’s parents, Jay and Kirsten, walked the land with her, and mailed us a baggie of soil. We held the soil in our hands, we studied the soil maps, and hoped it would work out –within a few months we had a letter from Mary Ellen and then an agreement to rent 5 acres starting in 2006. In the fall of 2005 we had 50 pounds of garlic to plant, a generous start-up gift from a mentor. But that 50 lbs was in Massachusetts, (and we were still working at our farm jobs there) and the farm to plant it on was right here. So over the phone we arranged with the farmer giving up the land to till an area large enough to house it. And we roped in much of Erin’s extended family and a few friends to plant it without us! Her parents, grandparents, cousins, and aunts and uncles planted it, via instructions sent in the mail. The garlic we grow today is the descendants of those cloves, thriving and vigorous as ever. It survived an unusual disease which knocked out a lot of the Midwest’s garlic production in 2012. There are a lot of reasons to love that stuff! We moved here in January and we were quite the sight on the freeway from Massachusetts to Minnesota. An old baby blue Ford truck with a homemade wooden box pulling a small antique tractor. We had many people staring at us and one of Ben’s uncles referred to us as “the Organics” riding our “Faithmobile.” He’s an electrician and we were fortunate enough to blow the tail lights just a half hour from his house in western New York. That winter we built a greenhouse — the predecessor to the one there now — and the first summer we had 7 CSA members; some family, and intentionally some strangers. We are delighted that most of them are still enjoying the farm. 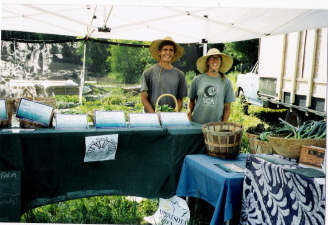 From 2006-2008 we went to 2 or 3 farmer’s markets a week, and then expanded to 25 and 40 CSA members the following years. We washed veggies in the shade of our “custom-built” box truck in front of the greenhouse, and drove the truck into the shade to keep veggies cool until the afternoon share pickups. Share pickups were under a 10×10 market tent. It was lovely, but was lots of lifting and setup for us, and not good if it ever rained. Which it rarely did those years. When it rained it poured, and often hailed, but that’s a longer story. In the spring of 2008 we were able to buy the main field west of the driveway, and the house and woods, thanks to Mary Ellen’s willingness to work with and interest in seeing us succeed. In the fall of 2008 we were able to get a Beginning Farmer Loan from the USDA Farm Service Agency to build the barn (aka your tax dollars doing something to feel good about) –we hired a barn builder who found a 100 year old barn in Mankato that was probably going to be destroyed for a parking lot, so they tore it down and reconstructed it here. 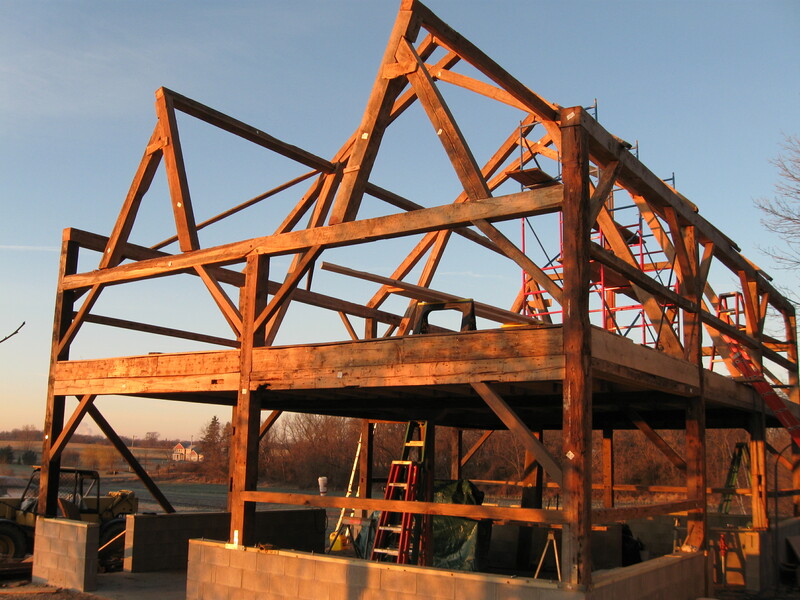 Dozens of you helped erect the timber frame over a couple weekend barn-raising days, and later to finish the floor and roof etc. We are so grateful to you all and we were so happy that we were moving up in the world! From then on we expanded our CSA by about 25 members each year until 2013. Since then we have slowly added about 5 or 10 members each year. We plan to stay at about 175 members from now on. During that time, we have also expanded our wholesale accounts for diversity in marketing and are growing more of the crops that work well for us, such as lettuce, carrots, beets and spinach. These 10 seasons have been a wonderful whirlwind and we feel as though we are entering the next 10 seasons on solid ground for a sustained bountiful harvest. (Right, Mother Nature?!) Thank you all for coming along for the ride! This week we’ll delve into some heartier veggies, though it’s hard to say if it will feel like a toe-dip or cannonball into summer eating. Probably more of a toe-dip, since the plants are just starting to mature, their harvest will mostly trickle in. Broccoli, cabbage, summer squash and zucchini are all starting to trickle in, so we’ll have a limited number of these this week and more next week. We’ll also add baby leeks (which are very mild and can be used much like scallions). We’ll have all the same greens and leaf lettuce. Head lettuce we’ll have 1-3 more weeks, but fewer varieties, since the butterheads and romaines don’t like heat it’s not worth planting them for this late of a harvest. It’ll mostly be red leaf and summercrisp, with some red romaine. Garlic scapes will probably go this week and then be done. We switched over to them from the spring garlic stalks since the latter were getting tougher-skinned as they mature, which the scapes will do soon too. We told some of you about garlic scape pesto (see recipe here) but we also love just freezing scapes with olive oil: chop coarsely by hand, then puree in a food processor with some olive oil, and put in ice cube trays to freeze. The cubes add some great green summer zest to winter cooking. After this week we’ll have to wait until garlic harvest in late July to have more fresh garlic flavor, but scapes last forever in a plastic bag in the fridge, so don’t be shy in how much you take. Spinach is probably done until September. It starts to bolt, or flower, in warmer weather. The plants are super healthy so we may just mow them and see if they grow back nice enough to harvest again. They might, they might not. After this one long-awaited successful spring spinach crop, we’re considering adding a smaller second planting next year, to see if we can get an extra week or two of harvest for you. We’ll have fewer radishes but still turnips. Soon we’ll switch from a “counting” mix and match (ie the 16 pieces table) to a “bag size” mix and match, (ie where you fill 1/2 white thank you bag with the crops you’d like to have) So keep on your toes and watch those signs! Y’all are great. Thanks for adapting to this unique way of getting your veggies. We hope it keeps working for you for years to come. Weatherwise, we love these 80s highs, because the veggies do. They thrive in this weather. 90s are stressful, just like they are for people, and all sorts of unwanted things start to happen. But this, this is good. What a fantastic strawberry harvest. Better flavor compared to the excessive rain in recent springs, and better size thanks for teachable farmers (we changed a couple minor things about how we grow them.) There are lots of berries left to come, though they will start being the smaller ones soon. Thanks to those who were able to pick this weekend, it helped keep a lot from going by. We should still have plenty available for those who couldn’t make it, and we should be able to keep the picking limits high. You may have figured out that the picking limits were higher at the end of the week as the berries ripened faster and faster — don’t worry, we keep track and do our very best to make sure each pickup day gets the same amount of berries (or peas or other high-demand U-pick crops) over the course of the picking season. Plus cilantro, dill, lemon balm, mint, and now pea shoots. 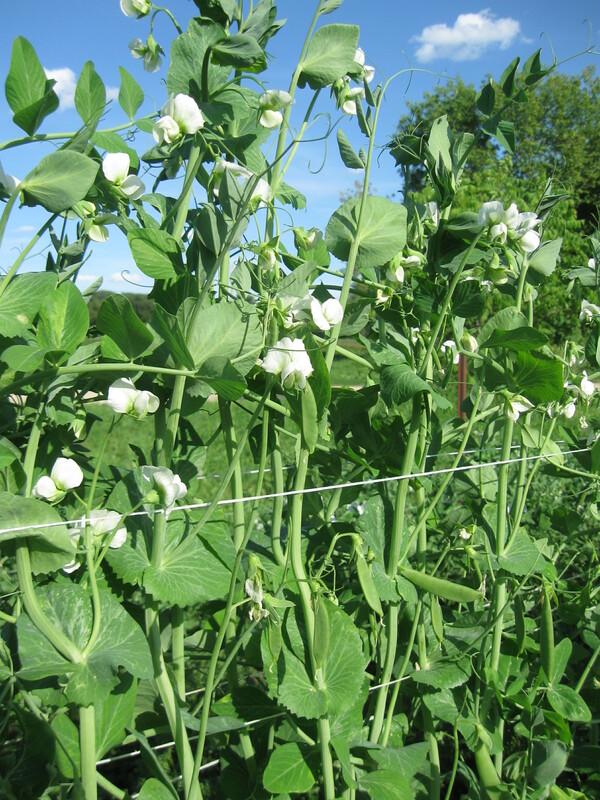 The pea shoots are in front of the greenhouse — they are a short pea variety (knee high) whose tendrils, or shoots, are especially tender and good for snacking, tossing in salads or stir-frying. Pinch or use scissors to cut the top 3″ off. These are a nice addition to early summer meals and will be good for 2-3 weeks. Snap peas will be starting soon, probably trickling in later this week. It’s picking time! Please always check the U-pick board when you’re here to confirm what’s available and picking amounts. Please bring your own scissors for U-pick. If you don’t have them with you, ask Erin or Ben and we can loan them. PARTY HERE THIS SATURDAY — our 10th Year Bash! June 27th, 4pm on. Potluck –so bring a dish to share, your own utensils and plates, and a blanket and/or chairs to sit on. Puppet-making and samples start at 4, Counterfactuals play at 5pm in front of the greenhouse, potluck and local goat cheese samples go on as you’re hungry, local beer and hard cider samples as you’re thirsty. Rain date Sunday, June 28th. Once our parking area fills up, there will be someone to direct you to the neighboring farm to park (at Spring Wind Farm&Little Hill Berry Farm.) You can walk on our farm roads to the party. If anyone is interested with setup and takedown anytime Saturday, we’d love your help, please let us know. View the evite (and upcoming reminder) for details and RSVP there, or to us in person. All are welcome. We hope you can make it! Parking Please park on the right (east) side of the driveway. Try to pull in perpendicular to the driveway so you can turn around as you back out. Or back in, perpendicular to the driveway, so you can pull straight out. Wash turnips well and slice them thinly (a mandolin works well if you have one). Place turnip slices in a small bowl and toss with the salt. Let rest until there is a pool of liquid on the bottom of the bowl, about 30 minutes. Drain turnips of the salty water and pack into a pint sized mason jar. Add vinegar, sugar, pepper and ginger slices. Apply a watertight lid and shake to combine. Place pickled turnips in the fridge and chill before eating. Pickles can be eaten within an hour of being made and will keep for at least a week. A very nice story. And it all began at the Food Bank farm!